It had been three years since Stacey Catlett’s last mammogram. That came as a surprise to her. Stacey, who is in treatment for invasive ductal carcinoma, acknowledges that she would have waited even longer to have a mammogram had it not been for a coworker who encouraged her to schedule one – a woman who had recently been diagnosed with breast cancer. Stacey had even dismissed a small lump she’d noticed in her left breast, deciding it was probably “just a cyst.” But personally knowing someone who had been diagnosed gave her the motivation she needed to make an appointment for a mammogram. Later, walking into a radiologist’s office, Stacey saw a pink bag sitting on a countertop. She could tell it was packed with information for a breast cancer patient, and she began to cry. “I already knew,” Stacey says. Stacey still vividly remembers when she was 18 and found out her mother had leukemia. Telling her own teenage daughter about the breast cancer diagnosis was the first and most intense of a series of physically and emotionally painful moments, known only to cancer patients. “I just tried to explain it the best I could,” says Stacey. The Catletts made a commitment to be completely open with their daughter through the entire process. In addition to surgery, there was standard treatment bringing aches and pains, swelling from steroids, fatigue, and hair loss. “The hair, it affected me a lot more than I thought it would,” Richard says. Richard Catlett has a career in law enforcement and a military background, but watching the woman he loves go through something as difficult as breast cancer was unlike anything he’d experienced. When people ask how he’s doing, Richard simply tells them that if Stacey is okay, he is okay, too. And Stacey is definitely okay. It hasn’t been easy by any stretch of the imagination, but she has persevered with a positive attitude, plenty of support from friends and family, faith and determination. 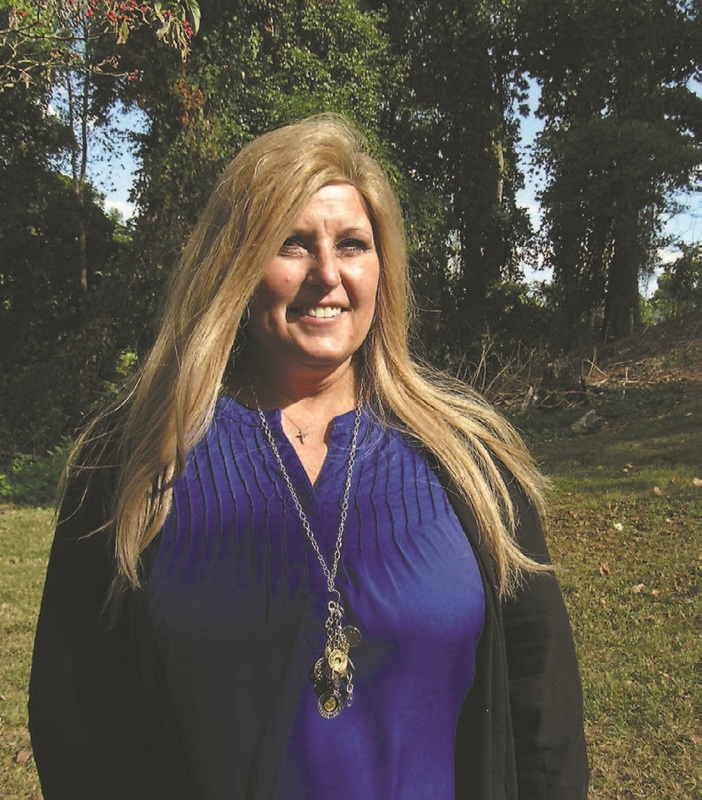 After hearing recommendations from friends and a hearty dose of prayer, Stacey contacted the office of Paul Dudrick, MD, a cancer surgeon at Fort Sanders Regional Medical Center. She was quickly connected with a patient navigator at Thompson Cancer Survival Center, someone designated to walk with her through treatment, help answer her questions, and make sure she never had to feel alone in her fight against cancer. “It was the most calming conversation, and she made me understand everything that was going on,” Stacey says. Stacey learned about the multi-disciplinary approach in which the surgeon meets with an oncologist and radiologist before decisions are made regarding the course of a patient’s treatment. She also found out that Thompson and Fort Sanders Regional place a high priority on inclusion of the patient’s family in the treatment process. It all made for a better experience, and a better chance for recovery. Today, Stacey continues her work at Tennessee State Bank, stays involved in her daughter’s day-to-day life, laughs, loves, and enjoys each passing moment. The lessons cancer has taught her were hard to learn, but she hopes that sharing her struggle will be a means of helping other women avoid one. Like so many wives and mothers, Stacey is always on the go. Slowing down for a mammography appointment didn’t seem possible, but it’s something she wants other busy women to know is an absolute must. While she will never know what would have happened if she hadn’t put off her mammogram, one thing Stacey knows for certain is that she now has a platform and a voice for encouraging women to take better care of themselves. To learn more about cancer treatment through Fort Sanders Regional Medical Center and Thompson Cancer Survival Center or to explore mammography options, visit www. thompsoncancer.com.